This guide will help you setup the Wi-Fi on your Netcomm NB604N modem. We have also presented an audio version of the instructions to assist you in your Wi-Fi Setup below. A Wi-Fi standard is an approved method to transmit data. Both the receiver and the sender will need to communicate using the same standard otherwise communication is lost. Older standards will not be able to broadcast and receive as well as new standards, due to being developed for the available technology at the time. Most older standards have now been retired due to their redundancy. Below are two examples of modern 802.11 Standards available in the market. 802.11n - Maximum theoretical throughput up to 300Mbps with a range up to 54 metres. 802.11n can be affected by building material, other access points and the number of wireless clients. 802.11ac – Maximum theoretical throughput up to 1300Mbps and is backwards compatible to other standards 802.11b/g/n. Range is up to 51 metres, however it broadcasts at 5Ghz which is a long wave length. This means any sort of interference will be noticed and drop the performance significantly. For best 5Ghz performance, you need to be within line-of-sight to the router. A Mesh wireless network is a series of wireless radios and nodes that communicate with each other. Think of it as multiple wireless routers all working together to help provide greater coverage in your home. A Mesh Wi-Fi network is a great alternative to setting up a Wireless extender if you want to expand your wireless network to avoid any dead spots. Unlike wireless extenders, each mesh node can distribute internet at full-speeds. We recommend the Google Wifi (3-pack) mesh system for most Kiwi homes. Google Wifi delivers seamless Wi-Fi coverage throughout your home, so everyone can have fast internet in every room. Find out about Google Wifi rental here. Google Wifi (3-pack) is available to existing customers for $15/month rental on a 12-month broadband contract. You can add Google Wifi to your account anytime through My Slingshot. Slingshot customers can purchase Google Wifi (3-pack) at a discounted rate of $399.00 incl. GST (RRP $599.00 – a $200.00 discount!). Your account will need to be in credit by $399.00 (check out our payment options here), then just call the team on 0800 89 6000 and they’ll submit an order for you. A courier delivery fee of $14.95 (incl. GST) will apply. What happens if I decide to leave Slingshot and I have a Google Wifi rental? Google Wifi is an expensive bit of kit, so we have made an affordable rental option for our customers. In the unlikely event that you no longer require Google Wifi or decide to leave Slingshot, you'll need to return the Google Wifi units to us. If you’d like to cancel, just call the team on 0800 89 2027 and we will send a return bag for your Google Wifi. Once you have set up Google Wifi, we highly recommend turning off your modem’s Wi-Fi so that it doesn’t interfere with Google Wifi’s mesh network. In the My Slingshot app, select Wi-Fi from the menu and turn your modem Wi-Fi off. You can also do this at My Slingshot. Connecting your Android to your wireless network for the first time is a straightforward process. From your Home screen, open Apps and then Settings. Under Wireless and Networks, make sure Wi-Fi is turned on. Then press Wi-Fi. You may have to wait a moment as your Android device detects wireless networks in your area, and displays them in a list. To rescan for available networks at any time, select Scan. Press the name of your network, and enter the password when requested. If you need further assistance, please speak with the supplier of your android device. Connecting your iPhone to your wireless network for the first time is a straightforward process. From your Home screen, open Settings and then Wi-Fi. Turn on Wi-Fi. 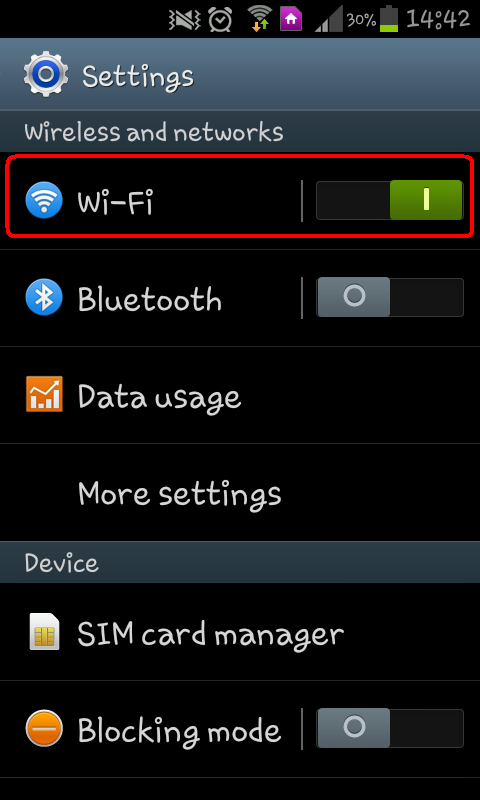 Your device will then automatically search for any of the available Wi-Fi networks in your area. Underneath the Wi-Fi heading on the right of the screen, you should see your wireless network with a blue tick. This means that you're connected! If you need further assistance, please see the Apple Support site. Connecting your iPad to your wireless network for the first time is a straightforward process. In the top of the navigation menu, tap on Wi-Fi. Make sure the Wi-Fi is turned on. A new screen will slide in from the right, showing a list of available wireless networks. Press the name of your network, and enter the password when requested.